Greenhouse Gardening. As Easy as 1-2-3!! 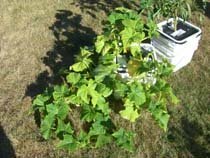 123 Greenhouse Gardening.com DIY Information. It's amazing how many doors Greenhouses can open to the average backyard gardener. From producing food year round, to opening a backyard nursery for producing free plants for resale. Fun family projects, Growing Fish, community gardens, so much can happen in a very small space. The techniques and information found on this site is offered to share some of the innovative ideas that people are accomplishing with the use of a greenhouse. I started this site after looking for a way to protect my Bonsai Trees in 2007. I was amazed. 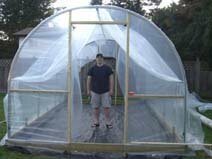 I quickly became a greenhouse enthusiast, and found the best way, for me, to build a greenhouse. This site was not-only meant to share all of the best information that I come across with other people, but also as a place that I could visit myself to take action on these projects and ideas myself, which I have. I hope that you are open to sharing your ideas and greenhouses - be sure to join our newsletter. With the cost of food increasingly on the rise, and knowing the benefits greenhouse gardening can offer to a Family – food production has become a key focus on our site. 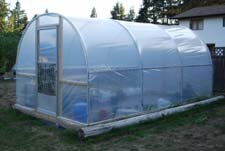 Greenhouse Plans - Build your own (Be sure to Join our Newsletter and you can take a look at the .pdf we made of our Hoop House Build - Step by Step with Pictures. Backyard Nursery - This is a New one, we received questions on Backyard Nursery - so we put together some of the Better resources. Mike's info is Great!! Greenhouse Kits - Do It Yourself Plans, Kits, and Growing information. Hoop House- Poly Tunnels or High Tunnels (all the same thing) - we'll show you why we believe Hoop Houses are the best choice for year round food production. Aquaponics - Fish and Vegetables growing together. There’s something about the idea of creating a little self-supporting ecosystem in your own backyard. A little ecosystem that centers around you, and one that could potentially sustain your family as well. Greenhouse gardening can be used to create that ecosystem. Whether you are looking for ideas for a new one, or you are looking to build it, do it yourself, or just looking for project idea you can use to grow in an existing one, we believe you are in the right place and among some pretty good company. We also liked the idea of hearing what it is that you have growing in yours as well. Grow a lot, on a little bit of land. There are certain growing techniques that are only achievable in one. Provide your family with highly nutritious inexpensive food. Grow fresh Vegetables all year round. Auqaponics – Fish and Vegetables growing together. A Fun and rewarding Hobby – many interesting family hobbies, and small businesses, are only made possible through one, and a little imagination. And these were only a few of the benefits greenhouses have to offer. In fact we would love you to share your growing story as well. As a busy guy with a young Family, this is as close to an all around 4 Season Gardening method as I could find. The great Ron Popeil's quote often comes to mind after I leave the greenhouse:, "Set it and Forget it". (Long Intro, and Music, are works in progress:). Or, be sure to sign up to our Newsletter to keep in touch, and see Step by Step instructions of our Hoop House with Pictures. These two, for me, after endless research and actually doing it would have to be the best place to start. If you have any comments, good or..... I guess bad too. Please leave them on the Videos Youtube page. We will be adding more video too, so if you're interested please subscribe and share. We will also review the comments often to give us more ideas for upcoming videos, and reviews. Information for the Backyard, Urban, and Small Nursery/Greenhouse Grower. Plans and Designs - Free Resources We've scoured the internet to bring you the best designs and plans that are available on the internet. From Recycled materials to PVC pipe and everything in between.Kits So what is available in a Kit? The types of kits available along with the Pros and Cons of each material used. 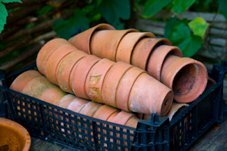 Top Year Round Gardening Resources - Reviews Here are a couple of my favorite Year Round Gardening Resources. You may be interested in our Books page as well. 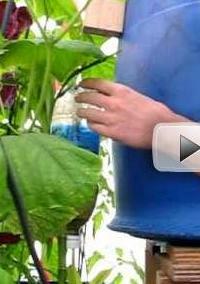 Self Watering Containers / Introduction to Greenhouse Gardening Self watering containers are great for growing added vegetables. Easily portable, and the best: No Weeding or Watering necessary!! Free Plans inside! Try one for yourself. Hoop Houses / High Tunnels I believe that the Hoop House needs a special mention on it's own. Vegetables can be grown year round, without the need of artificial heat etc.... Be sure to take a look at the resources above if you are truly interested in the Hoop House. Epcot Center - Land Pavillion Ride Video This, in my opinion, is a very inspirational Video. Take a look at the possibilities that a they can offer. Dirt or Soil Care It all comes down to dirt. Aquaponics - growing Fish and Plants together I was never completely sold on Hydroponic gardening because of the nutrients, and fertilizers. I love fish, and I am completely sold on Aquaponics! Rain Barrels Rain Barrels to water your Garden. Brilliant. We would love to hear from you. Give us your feedback, suggestions, questions..... Contact Us Here. 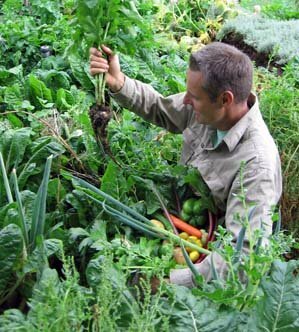 There is no better time to become more self reliant and produce your own fruits and vegetables. Greenhouse gardening is also a Great way to share your hobby with others. What a great way for kids to learn about their environment and ecosystem. Food can be grown! Make your own Self Watering Container out of buckets or Tupperware containers. Don't want to make your own. There is also information about Earthboxes too. These are great, either or. These plans are offered from Travis Hughey. An independent gardening enthusiast. Links on this page will take you to Travis's free e-book. A Malispina college student shares a video of her completed Barrelponic project. Complete with Tilapia.